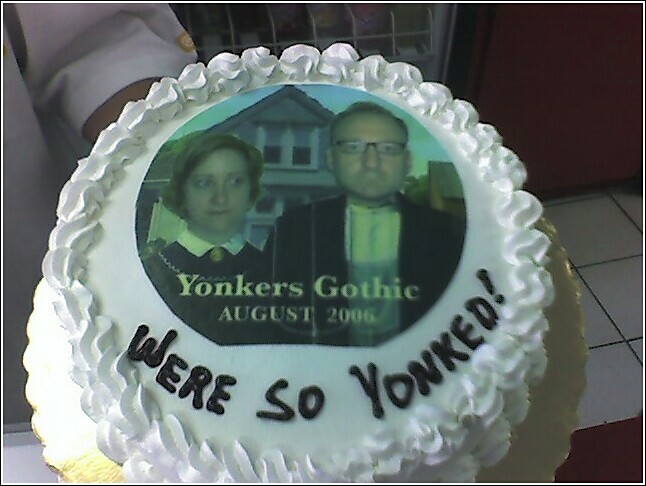 Yonked :: Diary of a New Home: We're so yonked! Everything has gone wrong today. Tres Leches Cake, decorated and made by local bakery Cristina's. It was very good. The party was a lot of fun, as Stephanie said. Amazingly, neither of us took any pictures, as we were too busy having fun, tending to guests, and just reveling in the fact that we can have a fair amount of people in our house and have a good and comfortable time. The only picture I took was of our cake (above) which was fabulous, as well as a lot of fun! It did work pretty well, all told. Another lesson learned: Get easily readable numbers for the house. A couple of people couldn't find it, despite our excellent directions. I did take two other pictures-- I was originally going to set up a tent on the outside of the property to hold people under, and to maybe store the beer/food and maybe even a grill eventually. The tent/cabana/whatever was from my mom, who had given it to my brother to do something similar. 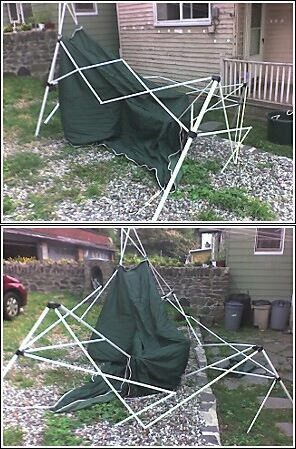 As you can see from these two pictures, I abandoned the tent idea after wrestling with it for half an hour. There were no directions in the package, but I'm pretty sure the tent is just broken. It's one of those things that if there is even a little bit of stress to the joints, they go all out of place. And at least two joints looked broken off. Sorry mom, but when I got it it was broken. Honest! Comments on "We're so yonked!"